1.1 How should my image be prepared and setup prior to print? 1.2 How do I find the print sizes that you offer, or find the largest size that can be printed? 1.3 What if the size that I want isn’t available? 1.4 What if I want extra white space surrounding the printed image? 1.5 Do you adjust or edit my image? 1.6 How do I place an order? 1.7 How do I become a customer? 1.8 What information is needed to become a customer? 1.9 How do I find product prices if I am not registered? 1.10 What if I need to change my order after it is submitted? 1.11 How do I cancel an order? 1.12 How do I check on the status of my order? 1.13 Why is there a minimum order charge? 1.14 What is your return policy? 1.15 Do you provide a warranty for your products? 2.1.1 What paper types do you offer? 2.1.2 How do you print my images? 2.1.3 What is the archival life of your prints? 2.1.4 What size is a wallet print? 2.1.5 What lamination options are available? 2.1.6 Can I mix paper types for an order? 2.2.1 What is a canvas print? 2.2.2 What canvas edge types are available? 2.2.3 What size stretcher bars are available? 2.2.4 How much of the print will be wrapped around the stretcher bars? 2.2.5 What is the advantage of a float frame? 2.2.6 What float frames are available? 2.2.7 How do I select the size, style and float frame to order? 2.2.8 What is the thickness and depth of a float frame? 2.2.9 How do I hang my gallery wrap or float wrap? 2.2.10 Are canvas prints and gallery wraps coated? 2.2.11 How can I add a border to my gallery wrap? 2.2.12 Can I embellish and paint on top of the canvas? 2.3.1 What is a PhotoPlaq? 2.3.2 What is the difference between a Standard, Float, Thick and Thin Plaq? 2.3.3 What laminate options are available? 2.3.4 What edge colors are available? 2.3.5 How do I hang my PhotoPlaq? 2.3.6 What paper types are available for PhotoPlaqs? 2.4.1 What is a Metal Print? 2.4.2 What is the difference between a sliver and white base? 2.4.3 What coating finishes are available? 2.4.4 How do I hang my Metal Print? 2.5.1 What is the difference between a Keepsake, Occasions and Signature Photo Book? 2.5.2 What kind of paper stock do you use? 2.5.3 What types of finishing do you offer? 2.5.4 How many greeting cards come in a pack? Do they include envelopes? 2.5.5 Do your press printed products come with presentation packaging? 2.5.6 How do I hang my Metal Print? 3.1 How long does production take for your products? 3.2 Do you offer Rush services or expedited shipping? 3.3 How much is shipping? 3.4 What carriers do you use to ship products? 3.5 How long does shipping transportation take? 3.6 Do you insure the shipped products? 3.7 Do you offer drop shipping and how much is it? 3.8 Do you ship to Hawaii, Alaska, PO Boxes, APOs or to international destinations? 3.9 How can I track my order while in transit? 3.10 What happens if my order arrives damaged? 3.11 Does the packaging for my order indicate it is from TPTPro? 3.12 How do I enter an alternate address for shipping or for drop shipping? 3.13 Do I need to pay a shipping fee each time I order? 3.14 Can shipping be combined for separate or multiple orders? 3.15 What if I am unable to receive or need to have my package held for me? 4.1 What size should my images be setup as? 4.2 What file type should my image be? 4.3 Which color space should I use? 4.4 What image resolution is needed? 4.5 Can my image have any additional layers or channels? 4.6 Which bit or image depth should I use? 4.7 How do I soft proof my images prior to ordering? 4.8 Where can I download ICC color profiles? How should I calibrate my monitor? What if I do not have a monitor color calibrator? 5.1 Do I need to be connected to the internet to use ROES? 5.2 Do I need to download ROES each time to order? 5.3 What if ROES is not downloading onto my desktop? 5.4 What are the system requirements to use ROES? 5.5 What if I encounter an error or have trouble ordering? 5.6 Can I send an image directly to you without using ROES? 5.7 Can I save my order before processing and sending it? 5.8 How do I use the ordering software if I have not registered? 5.9 What file types or image formats can I upload in ROES? 5.10 Can I send the order to an address other than my billing address? 5.11 Why are there different catalogs? 5.12 Can I combine orders for shipping? 5.13 How do I note any instructions or comments for orders? 5.14 How can I redownload the software? 5.15 Is Java important and how do I safely run it? 5.16 Is my transaction safe and secure when ordering inside of ROES? All available sizes are listed on the right side of each production page inside of the “Pricing” tab. The maximum size we are capable of printing depends on the product and/or paper type. To determine the largest sizes available, please review the sizes listed on the right side of each product page inside of the “Pricing” tab. Except for Metal Prints and Press Printed Products, if your desired size is not available, simply select and place your order for the next size up which accommodates both the width and height. This can be done when reviewing your order prior to checkout inside of ROES by selecting the “Special Instructions – Print Size/Trim Notes” checkbox on the right side under options. For example, if your desired size is 14” x 28”, select and place your order as a 15” x 30” and note “14x 28 final output size”. For Metal Prints and Press Printed Products, we are unfortunately unable to produce custom sizes at this time. Fine Art Prints include ½” and Rolled Canvas Prints (Unstretched) include 2” of white space on all four sides. Except for Metal Prints and Press Print Products, simply select a size that accommodates for the extra white space, and then indicate your desired final output and surrounding amount of white space for your printed image. This can be done when reviewing your order prior to checkout inside of ROES by selecting the “Special Instructions – Print Size/Trim Notes” checkbox on the right side under options. For Metal Prints and Press Print Products, white space must originally be added to the image being used. For example, if you are designing a 24×36 Metal Print with a Silver Base Color and wanted to have 1” of silver surrounding the image, the file should be sized at 24” x 36”, and should include a 22” x 34” image with 1” of dead space on all four sides. No, we print your image “as-is” and do not perform any adjustments. For this reason, it is important that you follow the “Print Ready Checklist” before sending your image for production, as well as soft proof your image with our supplied ICC Color Profiles. All orders should be placed via our ROES software. Details for specific products can be found on our How to Order page. If you encounter an error or problem when ordering, first consult our ROES Technical FAQs, and as a last resort send your image to us via our File Upload form. To become a customer or for more information about becoming a customer, click here. Please see our Account Registration page to review the information needed. For a professional account, a state-issued tax license is required to receive reseller pricing. Unfortunately, only registered users can view pricing. To sign up and see our prices, click here. First and foremost, it is imperative that you check and double-check your image prior to placing your order. Our Print Ready Checklist used in conjunction with soft proofing will provide you with a reasonable idea of the print output. Once your order has been submitted, it is almost immediately placed into production. Due to this reason, orders can only be modified or changed in certain situations if they have not been produced already or have not entered into key stages of the production workflow. To request a change or modification of your order, FIRST IMMEDIATELY CONTACT US DIRECTLY BY PHONE, TO FIND OUT IF IT IS AT ALL POSSIBLE. DO NOT CONTACT US BY EMAIL OR CONTACT FORM – WE MAY NOT SEE YOUR REQUEST IN TIME. PRODUCTION WILL CONTINUE AS USUAL UNLESS WE HAVE RECEIVED A REQUEST AND HAVE SPOKEN WITH YOU DIRECTLY ABOUT THE ORDER. Once we speak with you, we will promptly find the status of your order and inform you if changes or modifications are permissible, the cost for doing so, and the necessary action steps to take. First and foremost, it is imperative that you check and double-check your image prior to placing your order. Our Print Ready Checklist used in conjunction with soft proofing will provide you with a reasonable idea of the print output. Once your order has been submitted, it is almost immediately placed into production. Due to this reason, orders can only be canceled if production has not yet begun. IMMEDIATELY CONTACT US DIRECTLY BY PHONE TO FIND OUT IF IT IS AT ALL POSSIBLE. DO NOT CONTACT US BY EMAIL OR CONTACT FORM – WE MAY NOT SEE YOUR REQUEST IN TIME. PRODUCTION WILL CONTINUE AS USUAL UNLESS WE HAVE RECEIVED A REQUEST AND HAVE SPOKEN WITH YOU DIRECTLY ABOUT THE ORDER. Since there is a certain amount of time associated with in-taking, producing and shipping each order, the minimum order charge is in place to partially defer any administrative or shipping costs associated with low-value orders. Due to the on-demand nature of our services, we do not provide refunds after production has begun. Refunds are only available if production has not started for your order. The only time a refund may be issued is if a product has a defect or error that is within our control, in which case our sole remedy being an identical replacement product at no additional cost to the customer. No, we do not provide a warranty for any of our products. For more information, please review our Terms and Conditions page. Also known as a “Giclée” or “Fine Art” print, Canvas Prints are manufactured with the highest quality matte canvas paper using 12-color archival based inks, then finished with a protective coating to prevent against UV and other harmful damage. The term, “Giclée”, simply means a digital fine art print made on an inkjet printer, which our Canvas prints are. The edge types available for Canvas Gallery Wraps and Canvas Gallery Wraps in Float Frame are Mirrored, Traditional, Solid Color, Digital Stretch, Blurred, Blur Mirror and Blur Stretch. Both 1” and 1.5” stretcher bars are available, although the print sizes offered differ for each. For Canvas Gallery Wraps in Float Frame, we use 1.5” stretcher bars (float frames are not available with 1” stretcher bars). For a 1” Canvas Gallery Wrap, the image size printed includes 1.25” added to each of the four sides to accommodate the 1” stretcher bar size plus an additional ¼” which wraps around onto the backside. 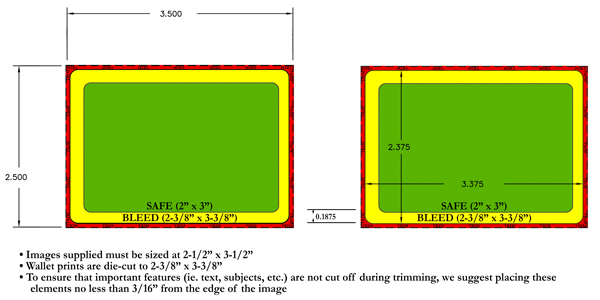 Likewise, a 1.5” Canvas Gallery Wrap includes 1.75” on all four sides to account for the 1.5” stretcher bar. For example, a 10×15 Canvas Gallery Wrap on 1.5” stretcher bars is actually printed at the size of 13.5” x 18.5”, allowing for 1.5” to stretch around the bar’s sides, with ¼” excess stretching around onto the backside. This is the favorite product of our photographers nationwide. A float frame gives you the elegance of a framed piece with the luxury of a canvas gallery wrap, while providing dimensionality to the image in a way that makes you a participant with the photo. For a step-by-step of how to order our products, click here. The thickness of a float frame varies slightly based on the frame moulding, although in general it is 1.75” in width (1.5” thick moulding, 0.25” gap), and 2.25” in depth/height. The lip of the float frame is actually higher than the face of the canvas, providing a slight amount of buffer room for added protection. Each Canvas Gallery Wrap and Canvas Gallery Wrap in Float Frame comes standard with a wire hanging system and cleat-and-nail wall hangers included. First, measure the area that you will be installing the presentation. Holding the presentation by it’s wire hanger with two-hands, hold the canvas up to the wall in the spot it will be hung. Use a pencil to mark the point where the vertical center of the presentation meets the wire hanger while taut. Next, place the backside of the metal hanging hardware included on the spot that was just marked and hammer the nail through the hanger’s hole in a downward direction. Finally, set the presentation into position by placing the wire hanger on the wall hanger’s hook facing up and towards you. Reposition or reinstall as needed. Although the above methods are suggested for hanging the final Canvas Gallery Wrap and Canvas Gallery Wrap in Float Frame presentations, we are not responsible for any damage, injury or problems that may occur, both direct and/or indirect as a consequence of installation. Yes, all Canvas Prints, Canvas Gallery Wraps (1” and 1.5”), and Canvas Gallery Wraps in Float Frame include either a Satin or Gloss finish coating. By default, our Satin coating is selected when ordering, although the Gloss finish can as well be selected instead. Yes, you can add a border or background to your gallery wrap by initially designing your image with the effects. Keep in mind that the image (except for traditional stretched canvas gallery wraps) will be the full frontal face of the gallery wrap, with an excess amount of stretching room wrapped around the stretcher bars. For exact sizes of this excess printed image to accommodate for the stretching room, please see FAQ question 2.2.4 How much of the print will be wrapped around the stretcher bars? Although it is not recommended to do so, some of our customers elect to paint on-top of the coated canvas to provide embellishments upon the image. While this is the case, we do recommend using a varnish prior to embellishing, such as the lineup of varnish products by Golden. A new and modern take on wall décor, PhotoPlaqs are made from premium eco-friendly, high-density fiber wood. The print is first laminated, and then adhered directly to an acid-free face of the wood. The edge is then beveled with your selected laminate color choice, and finally encapsulated on the back with a black laminate to provide a barrier against the elements. Each PhotoPlaq comes complete with a hanging system unique to each Plaq type. Each PhotoPlaq comes with a hanging system unique to the Plaq type. Keyhole Hanger:The Standard PhotoPlaq includes keyhole slots and screws for easy hanging. First, measure the area that you will be installing the presentation. While using a level, next place the screws (or if included, place the screw guides) in the keyhole slots and lightly make a dimple on the wall as to where the screws will go. Be sure to hold the Plaq and the screws (or screw guides) firmly so that they do not slip out of your hand. Drill the screws into the wall where the dimple imprints were just made, being sure to leave roughly 1/8” to 1/4″ between the wall and the base of the screw’s head. Finally, set the Plaq into position by placing the screws into the keyhole slot and sliding the artwork sideways until it hangs securely. Reposition or reinstall as needed. French Cleat Hanger:Both the Float and Thick PhotoPlaq include a French Cleat hanging system and screws for quick and effortless hanging. First, measure the area that you will be installing the presentation. While using a level, place the wood hanger on the wall. Insert and tighten the screws so that the wood hanger remains snug on the wall. Once completed, simply place the Plaq onto the wood hanger so that it “locks” into place. Reposition or reinstall as needed. The vast majority of our press printed products are printed on either 100# or 110# archival quality paper. Calendars, printed book covers, and the pages of certain book products are printed on gloss cover stock, while the pages of other book products are printed on gloss text. Greeting cards are available in your choice of matte, pearlescent, linen, eco-friendly and watercolor stocks. Occasions and Signature collection books can be ordered with your choice of satin or gloss UV coating on the pages. Books ordered with printed full-wrap photo covers come with a protective laminate in either gloss or satin. Cards printed on matte and pearlescent stock and trader cards are also available with option gloss or satin finishes. We offer flat and folded cards in boxes of 25. All greeting cards come with standard white envelopes. Gold and silver foil envelopes are available as options. All of our premium photo book products come standard with heirloom presentation packaging. Typical production time is between 1 to 3 business days for all Prints, 3 to 5 business days for Mounted Prints, 3 to 5 business days for all Canvas products, 5 to 7 business days for all PhotoPlaq products, 5 to 7 business days for all Metal Print products, and 1 to 4 business days for all Press Printed products. Yes, we offer both Rush Services and expedited shipping services as separate options. Rush orders incur a charge of 50% of the total order value, and elevates the order within the production queue. Depending on the product, Rush orders will typically go out the same day as ordered, or will be processed through production up to 3 days ahead of schedule. For expedited shipping of your order, we additionally offer both Next Day and 2nd Day services for prompt delivery. These optional services and their costs are available inside of ROES at checkout. This can be done when reviewing your order prior to checkout inside of ROES by selecting the “Additional Order Options – RUSH Order” checkbox on the right side under options. We use reputable shipping carriers to ensure that all final prints and presentations arrive at their final destination as safe as possible. All products are shipped with tracking via USPS or FedEx, depending on the product and size. In some situations, UPS may as well be used for delivery. For oversized presentations that do not meet USPS or FedEx package requirements and require shipment by freight, our common carrier of choice is R&L Carriers. At our discretion, we may substitute the selected shipping carrier, although the delivery time will be maintained to ensure timely delivery. The turnaround time for shipments is anywhere from 1 to 4 business days, and varies based on the carrier and/or service selected. For more information, please review the typical delivery time and FedEx Ground Service Map available on our Shipping and Turnaround page. Each shipping option includes insurance of the packaged contents already built into the price and are insured for the order’s purchased value. For more information, please review the Shipping Insurance section on our Shipping and Turnaround page. Yes, we do provide drop shipping. Whether you are shipping the products to your location, or are drop shipping them to your end client, the price is the same and does not change. For prints drop shipped or sent directly to you in boutique packaging, the shipping price again does not change. Yes, we can ship to Hawaii, Alaska, PO Boxes, APOs, and international destinations. Hawaii and Alaska: Additional costs apply to the shipping price charged. Flat Rate shipping prices are only available for the 48-Contingent United States. For more information, contact us directly. PO Boxes: USPS is the only carrier that can ship to PO Boxes as neither FedEx or UPS allow for these types of deliveries. Due to USPS regulations of the size and weight allowable for packages, certain products can not be shipped to these locations with any carrier. APOs and International Destinations: Additional costs apply to the shipping price charged. Flat Rate shipping prices are only available for the 48-Contingent United States. For more information, contact us directly. In the rare occurrence that a package and its contents were to become lost or damaged while in transit and in the possession of the shipping carrier, please submit all claims to us directly (not the shipping carrier). If a claim is made, we will work in conjunction with the shipping carrier and claim adjusters to resolve the issue, with the sole remedy being an identical replacement product at no additional cost to the customer. Retail and Enthusiast Customers: Yes, our information is indicated in the “Return To” address. To enter an alternate address for shipping or for drop shipping the items, simply input the address in ROES at the time of checkout. Once you have selected your shipping option at checkout, the input fields will appear to allow for the information to be entered (be sure that the “Use billing address for shipping” checkbox is not selected). Yes, a nominal shipping fee is charged for each order, and a shipping option must be selected in ROES at checkout. If individual orders are being sent to the same location, you can combine the shipments together and receive a refund of the difference. For more information, please review the question below entitled “Can shipping be combined for separate or multiple orders?” If orders are being picked-up from the lab directly, a shipping fee is not incurred on the order. If you are unable to accept or receive your package and would like to have it held for you, both USPS and FedEx offer these services at no additional fee. If you would like us to have the package held at your local post office, let us know by selecting the “Print Order Comments/Notes” check box when reviewing the items in your cart just before checkout, on the right side under “Options”, and provide your request. FedEx Shipped Orders: To request that your package be held at a FedEx Office location, enter your tracking or door tag number at fedex.com/tracking and select “Hold at Location”, or by calling 1-800-GO-FEDEX (800-463-3339) and providing them your tracking number. USPS Shipped Orders: Once your order has been shipped from our facility, it is typically more difficult to hold packages sent via USPS. If the option was noted when initially placing your order, we can add this service at no additional fee. However, once the item is in transit, typically the only way to hold the package is to contact your local post office directly, or by calling 1-800-ASK-USPS® (800-275-8777). The image size should be at the dimensions of the final output (ie. 8×12, 16×24, etc.). For more information, please review the Print Ready Checklist. 4.2 What file type should my images be? Images should be in either JPEG or TIFF final formats. For more information, please review the Print Ready Checklist. Images should be in either the sRGB, Adobe RGB, or ProPhoto RGB color space. For more information, please review the Print Ready Checklist. Images should have a resolution of 300ppi, although 72ppi is the minimum required. For more information, please review the Print Ready Checklist. No, images can not include any extra layers or alpha channels. For more information, please review the Print Ready Checklist. Images are recommended to be setup with an 8 bit image depth, although 16 bit is also accepted. For more information, please review the Print Ready Checklist. We have a full guide to soft proofing your images for various products and the ICC Profiles required to do so. You will need Photoshop, or another software that can proof with color profiles. Our ICC color profiles are available for download on each print product’s page on the right side under the “Specs” tab. As well, each profile is listed and available for download on our ICC Color Profile Downloads page located here. 4.9 How should I calibrate my monitor? What if I do not have a monitor color calibrator? The most optimal method for calibrating your monitor is with a color calibration device. We recommend the products made by both x-rite and datacolor. Alternatively, you can order hard proof 8×10 premium prints and manually adjust your monitor by holding these prints up to your monitor and adjusting the monitor’s brightness, contrast, and color (Red, Green and Blue) until your monitor closely resembles the print as displayed during soft proofing. For more information, feel free to contact us, or review this wiki on monitor calibration. Yes, an active internet connection is needed to download or launch ROES. Since the software requests that you sign-in, an internet connection is needed to validate your account information. No, you do not need to download ROES each time to order. Upon downloading the software your first time, a shortcut will appear on your desktop to relaunch the program later. Upon each relaunch, the software will automatically update itself, including the product catalogs within. There are a few reasons as to why ROES may not create a desktop shortcut upon download. For thorough information to resolve this issue, please review our ROES Technical FAQs, namely the following FAQs: 1.2 How can I create a ROES desktop shortcut if I skipped the option during the initial launch?, 3.2 Windows Java Desktop Shortcuts, 4.2 Mac/Apple Java Desktop Shortcuts. If the problem persists, feel free to contact us for assistance. For a complete list of error messages, bugs, and other reasons that might prevent you from ordering, please review our ROES Technical FAQs. If the problem persists, feel free to contact us for assistance. Yes, as a last resort, you may feel free to upload an image directly to us via our File Upload form. For files larger than 75mb or if you experience further trouble, we recommend the third party websites of YouSendIt or WeTransfer, and request that you send the file to contact@tptpro.com. Yes, once you have added an item into your cart, the software will automatically save your order when closing and exiting the program. ROES can only accept TIFFs and JPEG images. For information as to how images should be setup prior to upload, please review the Print Ready Checklist. Providing instructions or comments for your order is easy inside of ROES. This can be done by selecting the “Print Order Comments/Notes” check box when reviewing the items in your cart just before checkout, on the right side under “Options”. You may feel free to input any notes or remarks into this area and they will be reviewed by our staff when the order has been received. To redownload the ROES software, visit the Download ROES page by clicking here. Java is needed to order our products inside of the ROES Desktop Ordering System. Although the Department of Homeland Security issued a warning in early 2013 for a Java vulnerability, the most current Java version has in fact addressed these concerns. To download the latest version of Java for PC click on this link here, or for Mac/Apple users download the latest version here. For more information about any concerns with Java and it’s safety, please feel free to read this article from Semantec, makers of Norton Internet Security and Norton Antivirus. Yes, your transaction is processed via a secure server (https) and the information you provide during a payment transaction is encrypted.